Datacubist is a software company based in Finland with the mission to solve BIM exchange problems in the building industry. Datacubist develops simplebim, a BIM editor that enables targeted, professional quality BIM exchange and easily integrates into existing BIM applications, services and processes. Software developers can create add-ons for Simplebim or use the simplebim. Developer platform for creating stand-alone BIM solutions. 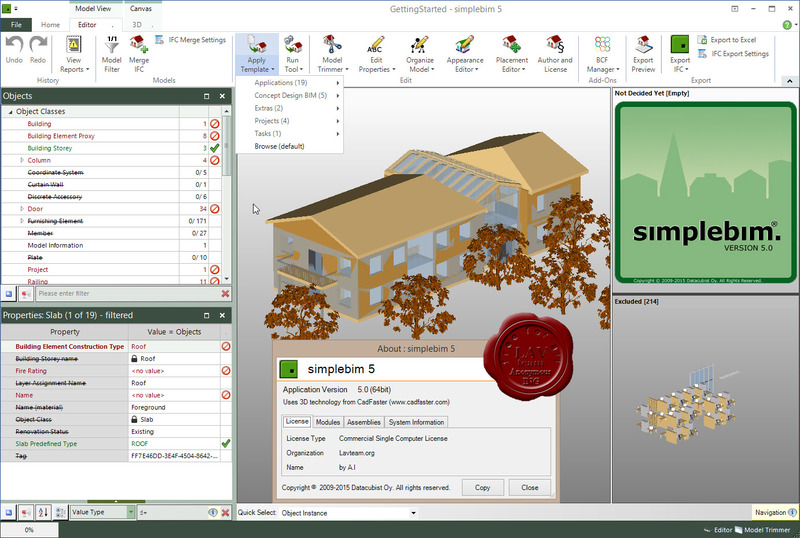 Simplebim is an application for editing IFC BIM models. Import IFC2x3 files, trim unnecessary objects and properties and edit property data. Preview the result and export the model into a new IFC2x3 file that is smaller, imports better into other IFC enabled applications and contains data that can be trusted. Simplebim is easy to learn and use. It has a modern ribbon based user interface with full drag and drop support and configurable workspaces.